 With the Eeboo alphabet cards, children learn the letters of the alphabet.  Letters in both upper and lower case. The Eeboo All Around the Land Wall Cards are beautiful letter cards with illustrations with a nostalgic style that children love. The cards are 8" by 10" and can serve as beautiful decoration in a child's bedroom or playroom. 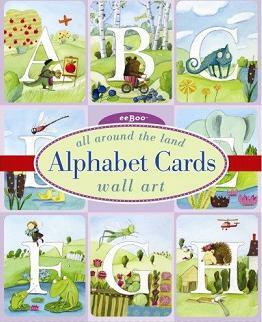 These cards are a great way for children to learn the letters of the alphabet. Unlike other cards which can be quickly destroyed by children, the Eeboo cards are very durable being made of thick quality stock paper. By looking at the cards and the illustrations on the cards, children learn the letters of the alphabet. The letters on the cards being in both upper case and lower case, they learn to recognize the letters in both upper and lower case. It may seem easy to us adults, but children get easily confused when the letters switch from lower to upper / upper to lower case!